i didn't have my first fig until i was 24 years old, and i didn't have fig jam until yesterday! let me tell you, fig jam is so delicious. i've often eyed fig jam at the specialty grocery store, but i never took the plunge because it was so expensive. the bad news is figs are always expensive, despite whether they are in fresh or jammed form. i paid $6.99 per pound for figs at my local coop. if i had any patience to wait until sunday to buy figs. figs run about $4 per carton at my farmer's market. but i don't have any patience at all, so i paid the $$$, made the jam, and i'm happy i did. that's because it's amazing and lends itself to many uses. i have big plans for this jam such as homemade fig poptarts, fig macarons, and savory uses such as fig and goat cheese tarts. yums. here are figs before they are turned into delicious jam! this jam is really easy to make, but it's not shelf safe. make sure you store it in the fridge and use within a couple weeks. 2 pounds fresh figs, washed, stemmed and cut into small pieces. 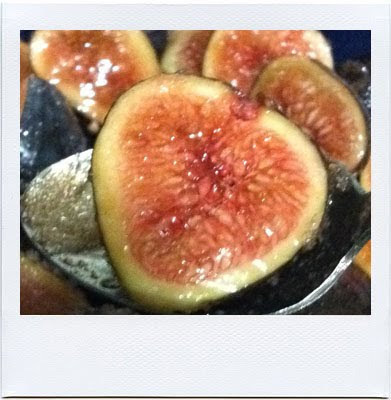 Place figs, sugar, lemon zest + juice, balsamic vinegar, vanilla and salt in a non-reactive, deep pot. Let the figs macerate in the pot for 3o minutes, occasionally stirring. Bring to a boil over medium heat while stirring. Keep stirring and cooking the jam for about 20 minutes, or until it's as thick as you'd like. You can break up the figs with your spoon as they break down in the jam. If you'd like, you can mash the remaining chunks of figs with a potato masher. Spoon into jam jars and allow to cool to room temperature. Store covered in refrigerator for several weeks.